At the end of 1989, after showing the occasional brille in F3000, Minardi invited Barilla to step in for the sidelined Pierluigi Martini. He qualified a steady 19th, which wasn't too bad for a journeyman driver like Paolo. His race lasted but a couple of yards, his clutch failing at the start. His encouraging qualifying performance led to a full campaign in 1990 but Paolo was out of his depth, failing to qualify six times. 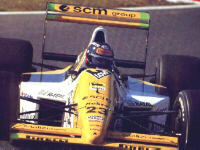 At the end of the year Giancarlo Minardi turned to talent again as Barilla was replaced by Gianni Morbidelli. Paolo was an excellent sportscar driver however, driving at the front for Martini Lancia and Joest Porsche in the heydays of the World Endurance Championship. In 1985 he had the most satisfying 24 hours of his life, sharing the Le Mans-winning Joest Porsche with Klaus Ludwig and 'John Winter'.